I hope you aren’t bored with sleeves yet! I prepared a few more patterns for you. 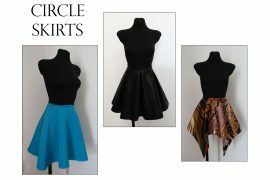 These are a mix of different styles for special occasion -garments. Later, there will be a post about sculptural/avant-garde sleeve patterns and then I promise I’ll be done with the theme for now! 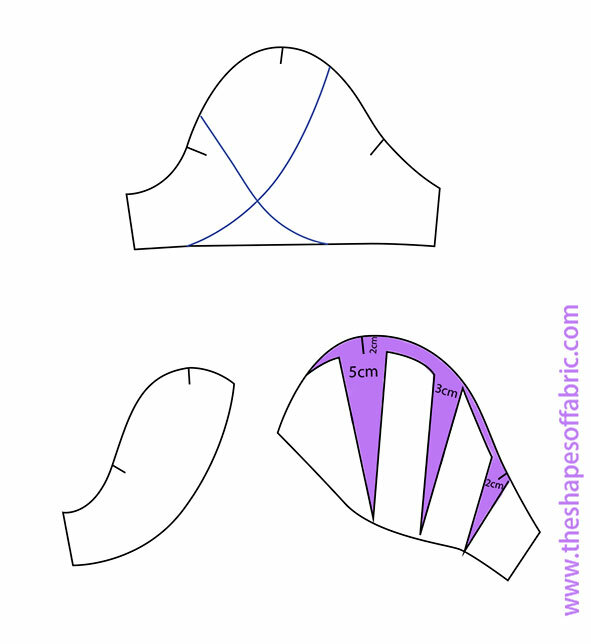 Feel free to download the half-scale basic sleeve pattern pdf to practice. And in case you haven’t checked out the previous posts, you’ll find more sleeve patterns here and here. Let’s start with the vertically gathered sleeve. 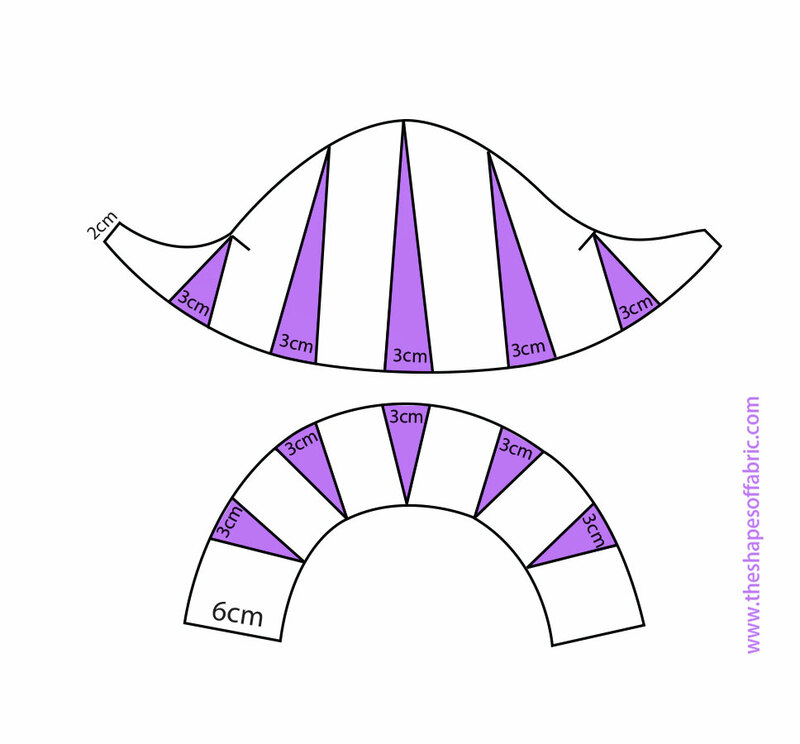 To make this pattern, first choose the length. The one in the picture is cut at elbow length. 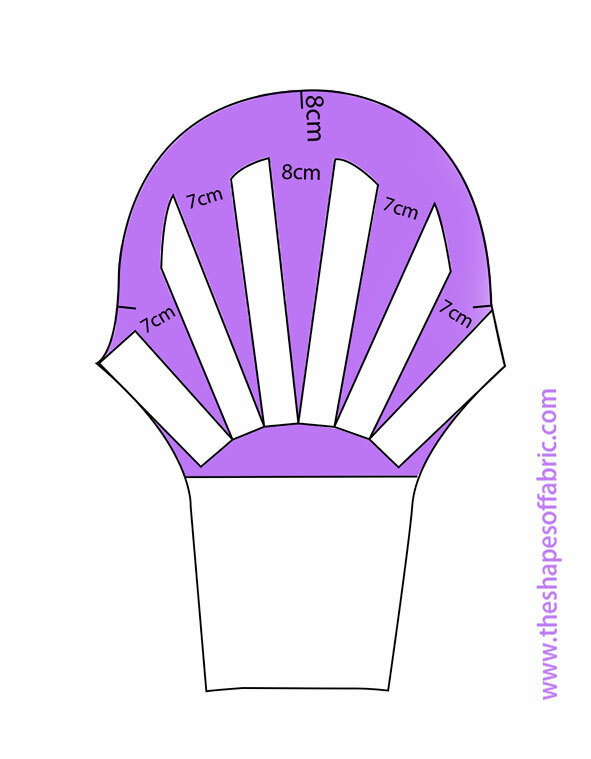 Divide the remaining sleeve length evenly with horizontal lines. 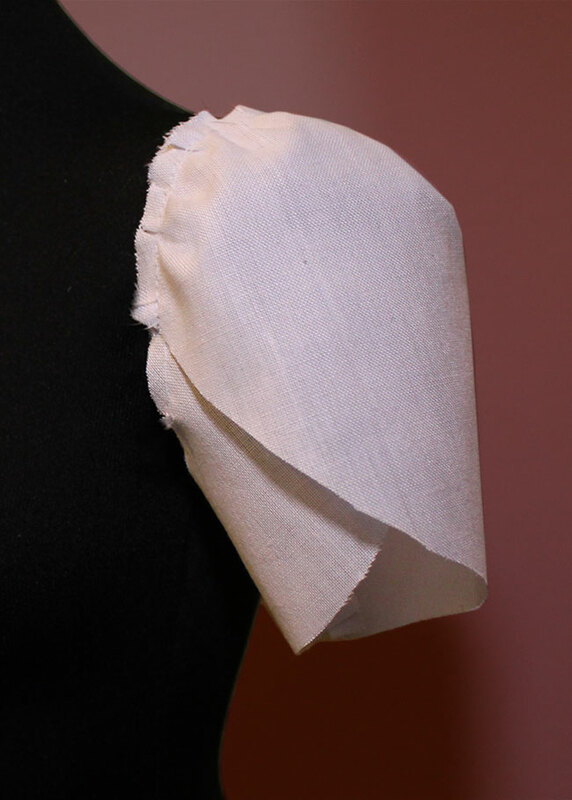 Then cut the sleeve vertically in half starting at the shoulder-line tack so that you can later match the central seam with the shoulder-seam. Add volume as in the picture. The more volume you add, more gathers you’ll have and vice versa. When finished, both sides should have the same length. 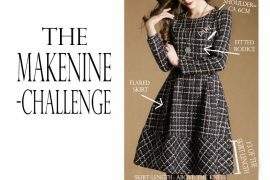 This pattern has the same idea as the previous sleeve, only in the opposite direction. You could even make a long sleeve, but I think the lantern looks better in the short version. 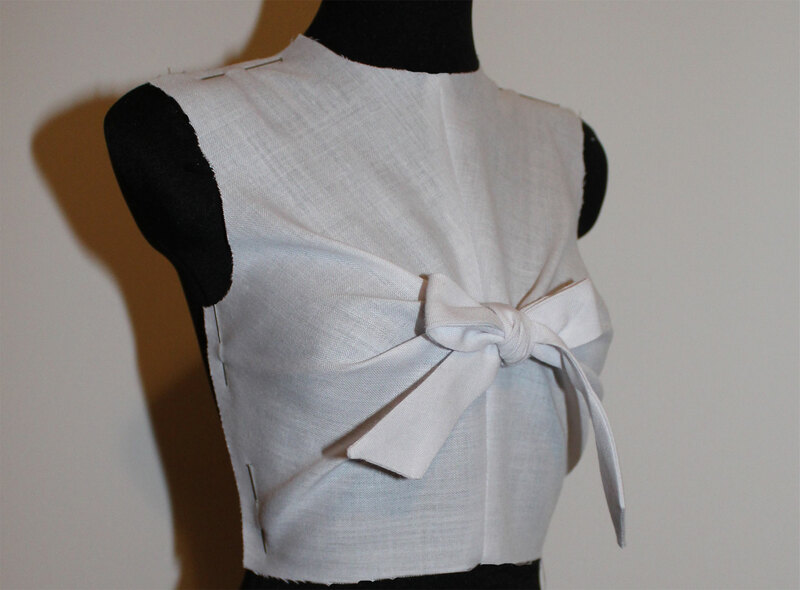 In my example, the total length is 8 cm from the beginning of the underarm-seam. I separated a 6cm bit to make the lower part. You can use the lines present in the half-scale pattern as your guide to add volume. 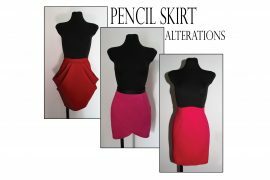 If you have your own pattern, draw the vertical lines before separating the two parts. This picture is just an idea of how much volume to add. Just don’t add too much, as the lantern will become flat. Be sure to add the same amount on both sides. 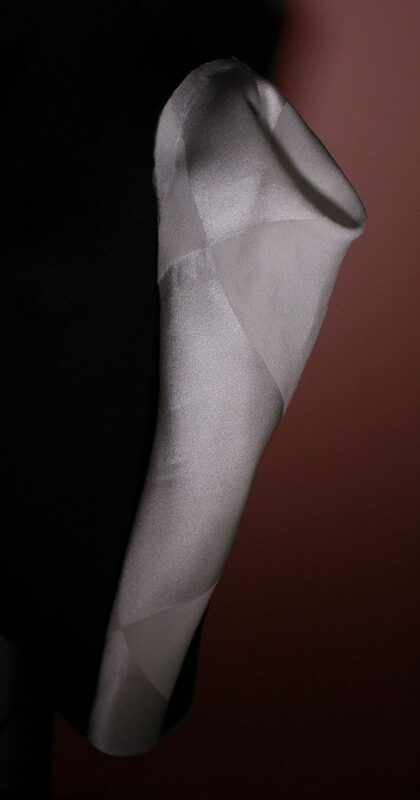 The lantern sleeve needs a heavy weight fabric or interfacing to maintain the shape. 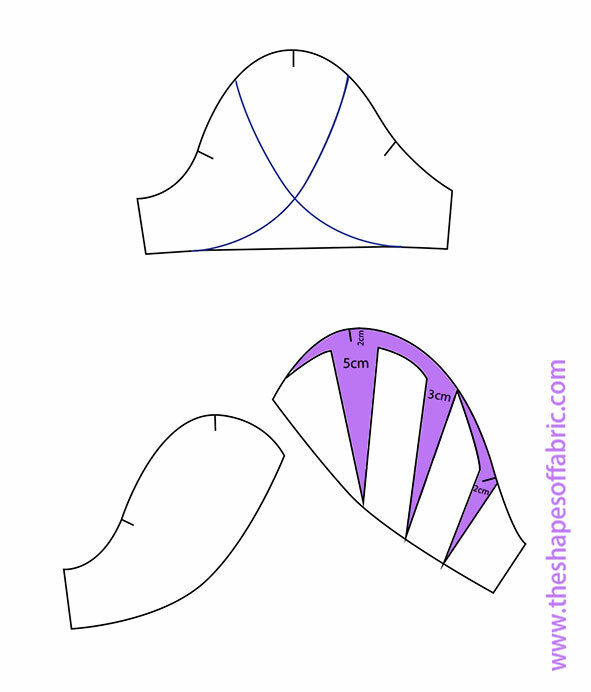 Continuing with short sleeves, here are two slightly different versions of the petal- or tulip-sleeve. 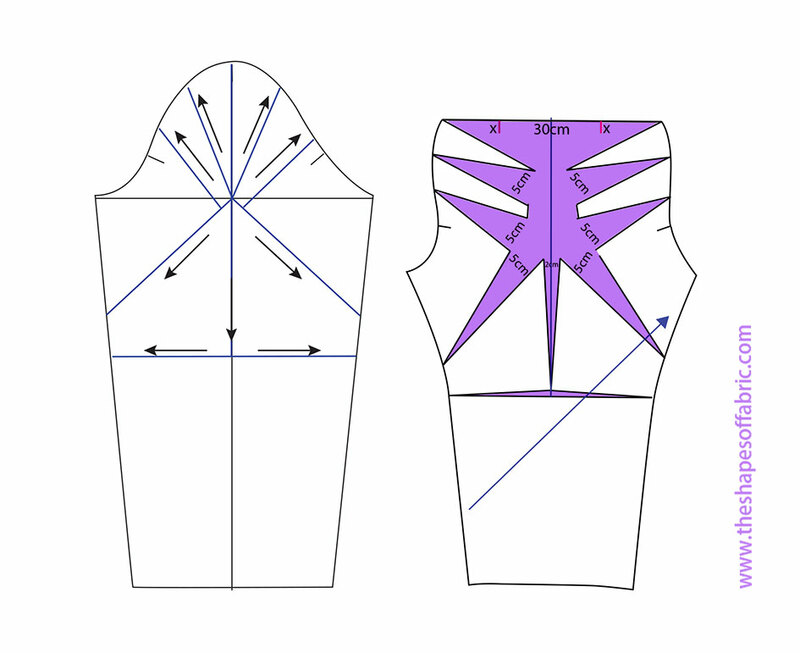 You can draft a symmetrical pattern with the two petals crossing in the centre of the arm. Or you could draft it more towards the front. In the pictures the difference doesn’t really show that much though. After having drawn the lines, copy the two petals and add volume to the one that remains on top as in the picture. That way you’ll get a nicer shape to the sleeve by gathering. 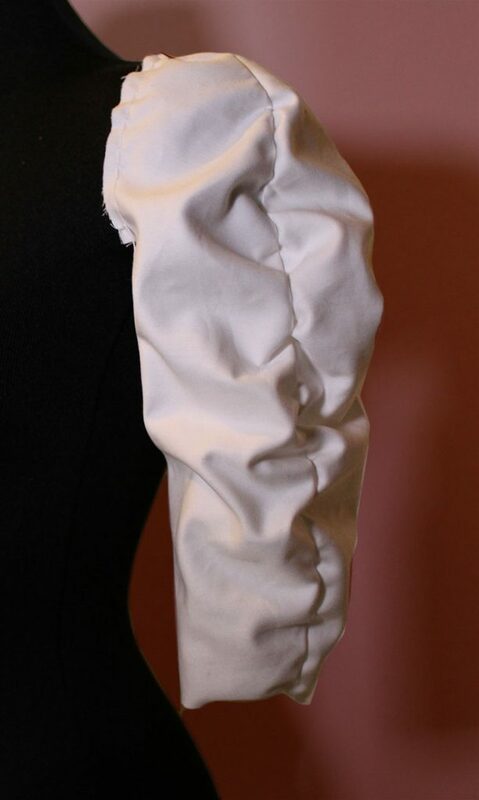 This sleeve has volume from the elbow-line upwards, while remaining otherwise slim. How to achieve that? 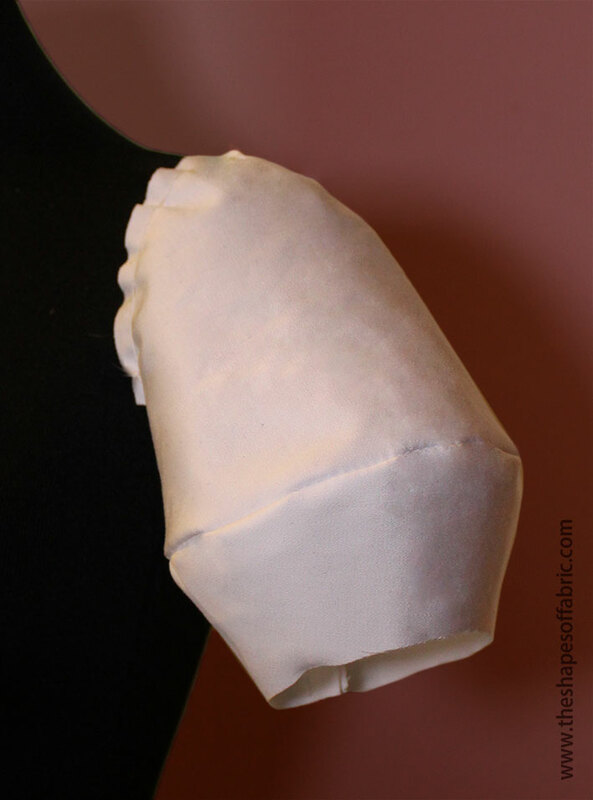 Well, just separate the two parts at the elbow line and add volume only at the upper part. In the example I already added quite a lot, but to get an even bigger sleeve, you could add more! When done, re-attach to the lower part with a smooth curve and fill the empty space that remains in the middle. I kept the trickiest pattern for last. This requires quite a few cuts. I recommend drawing them first on your sleeve pattern. Start by cutting open the central line all the way to the elbow line. Then open the elbow line in both directions without separating anything. Now you can cut all the rest, but stop at 1-2mm from each edge. 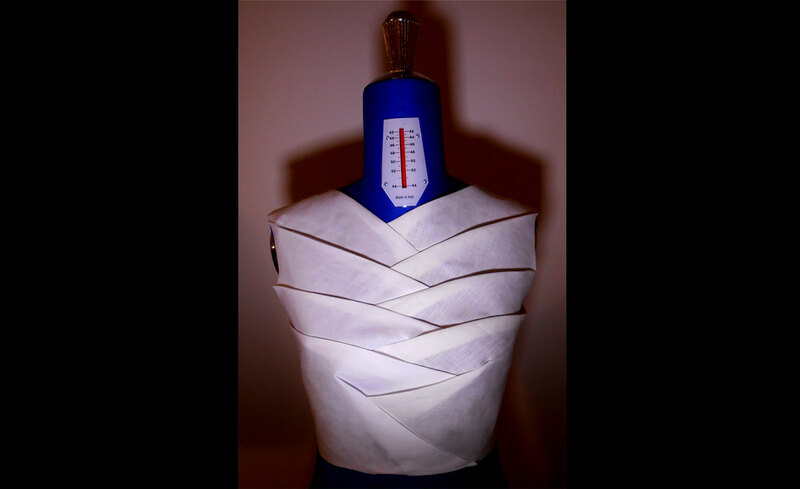 Place another paper underneath the pattern and start opening the slashes symmetrically until the top of the sleeve has become wide enough. You should be able to draw a straight line at the top. The sleeve is cut on bias. 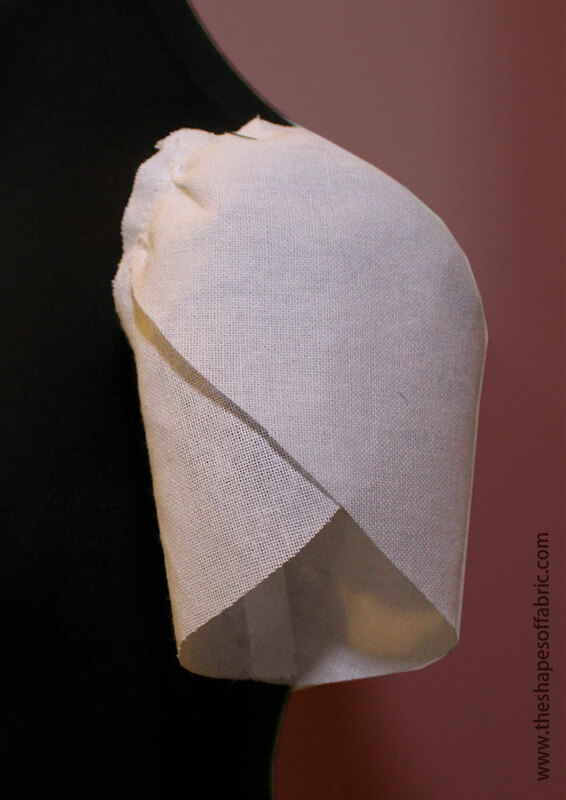 To close the sleeve-cap, just fold the straight line in half and sew. This is the middle of the drape. Afterwards you can attach the sleeve normally to the bodice. I find it very interesting to read your blog posts. It is surprising to see how different shapes are. That’s nice to hear. 🙂 Yes, it’s interesting to discover how different 3D shapes look like in flat patterns.